For Louisville High School senior Abigail Miller, her trip to Catalina Island at 13 years old made her realize her passion for photography. With a Sony Cybershot camera in her hands, she captured still moments and explored a world filled with imagination and creativity. After years of practice, Miller has received regional recognition for her work. Among numerous applicants, Miller’s photograph “Embarcadero” won a Regional Gold Key Award for the 2015 Scholastic Art and Writing Awards. “Embarcadero” focuses on the contrast of a buzzing city life and a comfortable home. 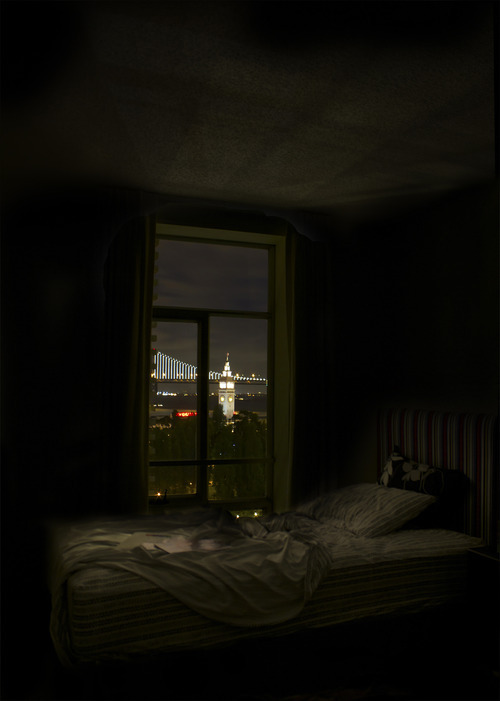 Taken in May 2014, the photo utilizes the city lights of San Francisco outside the window to illuminate the inside of her mother’s old apartment bedroom. Named after the street address, “Embarcadero” is composed of three different photographs with multiple exposures. The light from the city falling onto the bed and walls give the photograph depth and drama. “This was the first time I submitted any of my artwork so I was shocked when I heard the news that I had won,” Miller said. A major influence and mentor in Miller’s life is Ms. Dupuy, Louisville’s Photography and 2D Art teacher. The extensive programs offered by Louisville opened new avenues for Miller to learn new skills and develop the ones she already had. Louisville is one of the few high schools that still practices film developing with a dark room. “With the film, it’s unknown until you develop your picture. I love being able to see it in the process,” Miller shared. After taking two semesters of Computer Graphics, Miller said that these courses allowed her to “fall in love digitally” and discover a creative side she didn’t know she possessed. Miller is currently committed to attend one of the nation’s top art schools, The School of the Art Institute of Chicago, majoring in Fine Arts and Studio this fall. To view more of Abigail Miller’s photography, visit her Facebook page: Facebook.com/abimillerphotography.